The Week of Prayer for Christian Unity gives Christians an annual opportunity to continue their quest for the unity they already share in Christ. It is also a time to gather in praise of the Triune God and to deepen the understanding of the ecumenical movement. By joining in this annual celebration Christians raise their voices, hands and hearts to God seeking the fulfillment of the prayer of Jesus, the Son of God, "that they all may be one." The Week of Prayer also invites those who participate to use it as an opportunity to examine the effectiveness of the ecumenical movement in seeking to end the divisions among Christians. From the smallest to the largest communities, from all cultures, races and language groups, from all the baptized to all those in ordained ministry, the Week of Prayer is also an opportunity to ask examine the level of support they have given to this important movement in the life of the Church. An accounting of each Christian's discipleship and faithfulness to the proclamation of the Gospel - the good news of reconciliation - can be taken every year during the Week of Prayer for Christian Unity. What follows are some suggestions that we hope can assist Christians in the experience of observing the Week of Prayer for Christian Unity and celebrating the 2011 theme of "One in the apostles' teaching, fellowship, breaking of bread and prayer"(cf. Acts 2:42). This is by no means a comprehensive listing. We hope that as you create your own opportunities of prayer for Christian unity you will share those with others. Each new experience of prayer and gathering provides the Christian faith community with opportunities to grow in our understanding of one another as we celebrate our unity and common mission. 3. If your congregation is hosting the events this year remember to invite other Christians from your neighboring congregations to be part of the planning in any case, so that your celebration can be as ecumenical as possible. An ecumenical prayer service should be used. If so, liturgical roles should properly be shared. See the Ecumenical Celebration of the Word of God . 6. Suggest to local print and electronic journalists a feature story or news item on local ecumenical activity. While coverage of the Week of Prayer events is an appropriate suggestion, an intriguing story on some critical issue affecting interchurch life and witness today may have special interest and appeal for readers and viewers - especially the local reading and viewing audience. 7. Establish a page in your local church website on the theme and special events planned for the Week of Prayer. If you don't have a website, a free tool for building your own website is provided by the American Bible Society. In addition, if you currently have a website it may be linked with the American Bible Society's Church Directory. Contact: for information by e-mail: support@service.AmericanBible.org. To create your website goto www.forministry.com and click on "build a website." 1. Schedule at least one major Ecumenical Celebration of the Word of God during the Week of Prayer. The celebration can fall on any day of the week. Ecumenical Sunday, that is the Sunday falling within the Week of Prayer (January 23 in 2011), or the first day of the Week (January 18), or the last (January 25), often works well. These services of prayer tend to be easier to schedule as evening prayer services. In some communities Christians come together to pray for unity at another time of the year. The materials provided may be used flexibly. 5. Pray together ecumenically, or in your own church for the ministers, leaders and members of all the Christian congregations in your area. Include a petition for their success in proclaiming the Gospel of Jesus Christ, "that they all may be one." 14. Sponsor a contest - essay, prayer, art, poster - to involve young people in an effort to articulate and illustrate the quest for Christian unity or the 2011 Week of Prayer for Christian Unity theme. Offer prizes, display the entries and include the winners in a Week of Prayer for Christian Unity event. 15. Organize joint meetings of similar congregational groups - catechists and Sunday school teachers, parish councils and vestries, finance committees, youth, seniors, men's, women's, interchurch families for prayer, socializing and informal sharing of experiences. 16. 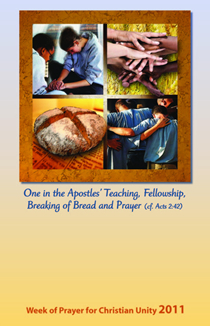 Schedule joint Bible study sessions around Acts 2:42-47 and the scriptural theme of "One in the apostles' teaching, fellowship, breaking of bread and prayer"(cf. Acts 2:42) as suggested for the 2011 Week of Prayer for Christian Unity. These could be hosted in homes or in parishes on a rotating basis. Ministers and teachers of various congregations could also take turns as worship leaders and study guides. The gathering should include informal prayer for the unity of the Church. Hopefully, the group might wish to extend such study and prayer throughout the year. 17. Offer a morning, afternoon or evening for reflection focusing on the prayer of Christ "that they all may be one" from John 17:1-26 and on this year's theme "One in the apostles' teaching, fellowship, breaking of bread and prayer".